Web site usage Terms and Conditions. Injection molding machines consist of a material hopper, an injection ram or screw-type plunger, and a heating unit. They are also known as presses, they hold the molds in which the components are shaped. Presses are rated by tonnage, which expresses the amount of clamping force that the machine can exert. This force keeps the mold closed during the injection process. Our injection machines vary from 77 tons to 2200 tons. The total clamp force needed is determined by the projected area of the part being molded. This projected area is multiplied by a clamp force of from 2 to 8 tons for each square inch of the projected areas. As a rule of thumb, 4 or 5 tons/in2 can be used for most products. If the plastic material is very stiff, it will require more injection pressure to fill the mold, thus more clamp tonnage to hold the mold closed. The required force can also be determined by the material used and the size of the part, larger parts require higher clamping force. Denver Plastics Nebraska provides tight-tolerance large tonnage injection molding up to 2200 tons with shot sizes of 360 ounces. Typical large tonnage components include large fenders, hoods, and panels for the ATV, UTV, Lawn & Garden, Watercraft, Automotive, Appliance and Consumer Product Industries. Many of these components require Class A Finishes with engineering-grade thermoplastic resins. 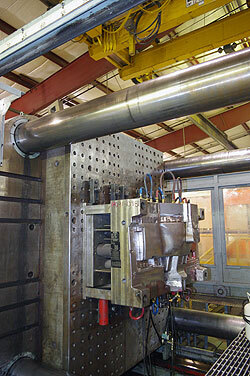 Denver Plastics Nebraska has over 25 years experience in large tonnage molding. We will meet or exceed your requirements with on-time delivery of zero defect products. We'd be happy to visit with you regarding your product and it's specific requirements. At Denver Plastics, combining leading edge production with superior customer service is a corporate philosophy we strive for everyday. From start to finish, from operators to plant supervisors, everyone participates in quality. This is demonstrated by our ISO 9001-2015 certification. We also are building partnerships with our suppliers for continuous improvements. At Denver Plastics, we provide innovative solutions for your injection molding needs. Great ideas come in all shapes and sizes. Denver Plastics full complement of machinery enables us to produce products from one ounce to 24 pounds. Our machines range from 77 ton to 2200 tons. See our ISO Certification page for a look at any of our companies' ISO certificates and to learn what they mean for you and your product. Use the QuikQuestion form below. If you need to attach a file to your question, please use our handy Request a Quote form instead.